Just not too long ago, I shared my attempt at baking a cranberry orange bread. I used half of the total amount of fresh cranberries I had and left half for other purposes. Now I’m going to share what I did with these incredible sour babies which I first loath but slowly starting to take a liking for. I baked Fresh Orange Cranberry Cookies! Imagine the burst of flavor as you bite into the cookie. I can imagine how the cookie would taste even before baking it. After baking it, I confirmed that I loved it more. What do you usually love to bake during Christmas? We do have an obsession with Ginger related desserts. Gingerbread Cookies are definitely one of them. Check out my CUTIE COUPLE Gingerbread cookies.. They are absolutely adorable… Ever since i started making them, I had ALOT of people requesting me to bake these for them. I’m pretty sure you’ll love them too. Another popular Christmas bake are these Orange Cranberry Cookies . The smelll oh the smell of these cookies are just so…… mouthwatering. You’ll stay in the kitchen for a good one hour I assure you. 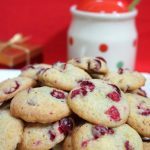 These cookies have a perfect combination of tartness from the fresh cranberries as well as sweetness from the cookies. The orange zest makes all the difference as it uppsss the flavor by alot. You gotta try these Orange Cranberry Cookies. They are LIFE CHANGING I PROMISE. If you ever make these Cookies, do tag me @sherbakes on instagram so i can share your delicious creations! Recipe below! Cream butter on medium-high speed for 2-3 minutes. Combine sugars and orange zest and mix until incorporated. Beat in the egg, vanilla and orange juice and mix until combined. Add the dry ingredients mixing well after each addition. Cover and refrigerate batter for at least 1 hour. Bake for 12 to 14 minutes. Allow cookies to cool for 3 mins before removing from cookie sheets. Made these and only used 3/4 cup sugar. Oven was way too hot at 375 degrees. Burnt the entire first batch. Scooped 1 TBS of dough at a time. Set the oven to 350 degrees for only 8 minutes and they were delicious.